Before I begin discussing “All Eyez on Me” as a film, I think it’s important to note that I only know the bare minimum about the life and music of Tupac Shakur. I understand his stature and legacy as an artist, but his catalogue is not one I’m very familiar with. I think that’s important to note my level of knowledge when it comes to Tupac, because All Eyez on Me is not a very good film, but my criticisms are of the film and certainly not the man. Eyez checks in at 140 minutes, so there’s no shortage of time to tell the story of such a compelling individual. The main problem with this movie is that it goes on for so long but doesn’t really say anything. Director Benny Boom (Next Day Air) capably directs the action and concert sequences. Demetrius Shipp Jr., in his film debut, delivers a very good and sincere performance as Tupac; he looks and sounds like the man without just doing an impression. Most impressive are the scenes in which he performs Tupac’s songs. Shipp really seems to be in his element there. He should have no trouble finding more roles after this. The issue with this film lies almost entirely with the script, credited to Jeremy Haft & Eddie Gonzalez and Steven Bagatourian. Each of the three writers have very little of consequence in their filmography, and their efforts here feel like a Cliff’s Notes version based on a Wikipedia page. They hit a lot of events, but they focus so much on WHAT happened, that they don’t spend enough time talking about WHY things happened. The screenplay frequently makes the case that Tupac is a legend, but it completely lacks depth and fails to illustrate what made him such a towering figure. For those already well-versed with Tupac’s life and music, this may be a more satisfying experience than it was for the uninitiated like myself. From what I do know about Tupac, he deserves a better film. –	Legends Will Never Die: The Making of All Eyez on Me. This is a standard feature, and runs just shy of 27 minutes. It’s very informative but nothing earth-shattering. –	Becoming Tupac. This runs about nine minutes, and features Demetrius Shipp Jr. talking about his history and thoughts about Tupac Shakur. It’s very enlightening and a good feature to have. –	Demetrius Shipp, Jr. Raw Audition Tape. This is just shy of five minutes and is very cool to see. More Blu-rays should include features like this. –	All Eyez on Me Conversations. This is over 30 minutes of roundtable discussions with the makers and stars of the movie. A lot of the material here is covered in the making-of feature. –	11 Deleted Scenes. Totaling about eight minutes, none of these scenes were particularly noteworthy and didn’t make the movie for a reason, as is usually the case. 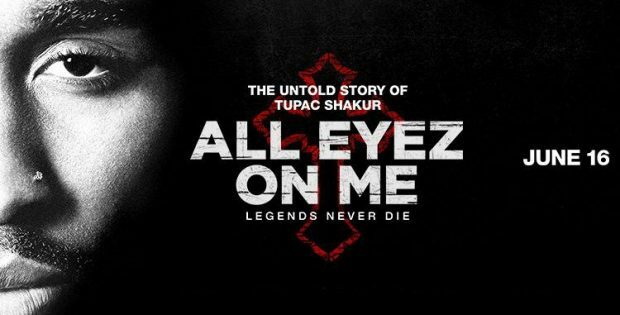 Lionsgate/Summit present All Eyez on Me. Directed by Benny Boom. Written by Jeremy Haft & Eddie Gonzalez and Steven Bagatourian. Starring Demetrius Shipp Jr., Kat Graham, Lauren Cohan, Hill Harper, and Daniel Gurra. Run Time: 140 minutes. Rated R. Released: September 5, 2017.